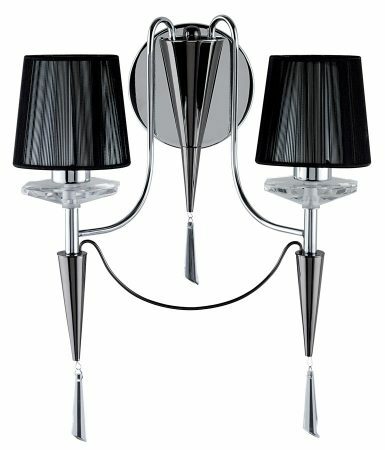 The Duchess chrome 2 lamp wall light with black string shades and crystal sconces is dark, sensual and looks fabulous on any bedroom, living room, dining room or kitchen wall. The black string shades provide a subtle source of light, and the piece is adorned with decorative crystal sconces. This modern chrome finish fitting sets the tone for any room. Part of the Duchess modern lighting range, a stylish chrome 2 light wall lamp with crystal sconces, black string shades and glass droplets. Shade dimensions: Height 80mm, top diameter 94mm, base diameter 100mm.